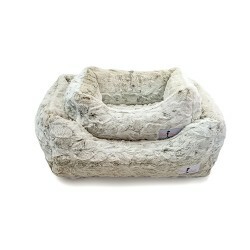 The Amour bed by Hello Doggie is enveloped with soft to the touch fabric your pup will love to curl .. Allow your pup to experience the comfort and softness of this elegant Luxe Bed by Hello Doggie. Low .. The Bella Beds by Hello Doggie are so soft to the touch you'll want to lay in them too! These handma..
Indulge your dog with a lavish Round Bed. We put a lot of love into each and every single .. This magnificent Crystal Dog Bed by Hello Doggie adds a touch of sparkle and comfort for your little..